There will likely be fewer Catholic baptisms and marriages next year… again. The August National Vital Statistics Report was just released and it shows fewer Americans (Catholics and non-Catholics) married or had children in 2009 than in 2008. What does it matter? As shown in this post, these two rates are statistically linked to the rate at which the sacraments of baptism and marriage are celebrated in the Catholic Church in the United States. Baptisms and marriages in the Church have declined in number each year since 2001. 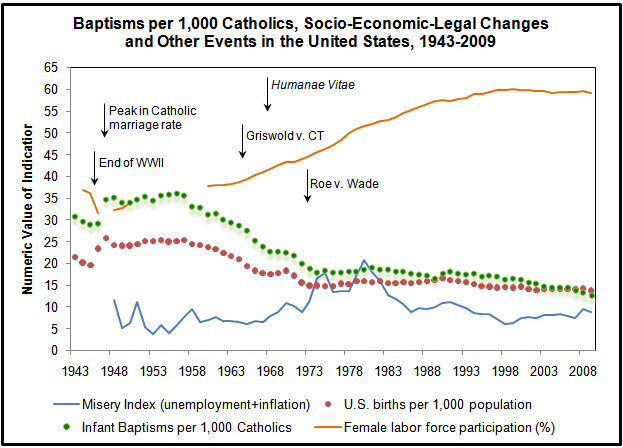 The crude infant baptism rate (annual number of infant baptisms per 1,000 Catholics) reached a peak during the post-war Baby Boom in 1956 at 36.1. In 2009, this had fallen to only 12.7 infant baptisms per 1,000 Catholics. The crude marriage rate (annual number of marriages celebrated in the Church per 1,000 Catholics) peaked right after World War II at 15.1 in 1947. In 2009, this had fallen to only 2.7 marriages in the Church per 1,000 Catholics. Despite these trends, the absolute number of Catholics in the United States continues to grow because the number of children born and raised Catholic has been generally sufficient to replace previous generations (life expectancies have risen as well) and other Catholics are added to the population through adult conversion from other faiths and through immigration of Catholics from other countries (even as some who are raised Catholic leave the faith at some point). Since the 1940s, the percentage of the U.S. population self-identifying as Catholic in polls has remained stable at around 22% to 26%. Yet, it is still of great concern that the absolute number of Catholic infant baptisms continues to dip annually. For example, the number of baptisms, when projected five years into the future, is correlated with entry-level Catholic school enrollment. If baptisms are falling, most likely enrollments will fall at the same pace. Are fewer Catholics choosing to baptize their children? Or are Catholics just having fewer children, as the national trend indicates? The answer to these questions implies very different potential responses. The data indicate that almost all self-identified Catholics having children are baptizing those children (most within a year of birth and some in later childhood years). In 2009, the crude birth rate for the United States was 13.8 per 1,000 population whereas the crude Catholic baptism rate was 12.7 per 1,000 Catholics. Historically, these two rates are strongly correlated (R=.984). 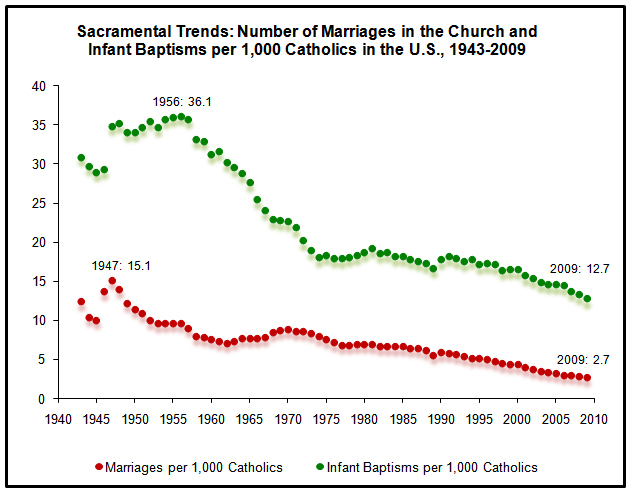 Most of the decline in Catholic baptisms is attributable to the decline in birth rates from the Baby Boom peak years. The Baby Boom was initiated as many young Americans began catching up for events that would have occurred had the Great Depression and World War II not interrupted so many of their lives. For example, demographer Pascal Whelpton calculated that “the babies born during 1950-54 included roughly 1.6 million that had been postponed during the 1940s or earlier, and 0.9 million that were advanced from 1955 or later because of the tendency of women to marry and have their children at younger ages” (see: “Why Did the United States’ Crude Birth Rate Decline During 1957-1962?” in Population Index, Vol. 29, No. 2, p.122). Yet, since this period Catholics and non-Catholics alike have begun to wait longer to marry and there have been other cultural changes that have affected Americans’ ideas of ideal family size. Between 1947 and 1962 the crude baptism rate was 30 or more per 1,000 Catholics in each year. Demographically, these years represent an extraordinary period. Even as the Baby Boom waned, Catholics tended to have higher fertility rates than non-Catholics for a time and this kept the number of baptisms from crashing along with the U.S. crude birth rate. But in the 1980s, social scientists began to identify a convergence of Catholic and Protestant fertility rates (see: “Religious Affiliation and the Fertility of Married Couples” William D. Mosher and Gerry E. Hendershot in Journal of Marriage and the Family, Vol. 46, No. 3.). Later in the 1990s among non-Hispanic white women, the Catholic fertility rate began to fall below Protestant levels as some Catholics began waiting longer to marry or decided not to marry at all (“Religion and Fertility in the United States: New Patterns” William D. Mosher, Linda B. Williams, and David P. Johnson in Demography, Vol. 29, No. 2). There are many potential ‘x-factors’ for the decline in Catholic fertility which, in turn, led to the decline in baptisms. It has been observed cross-nationally that female participation in the labor force can affect fertility rates. As the figure above shows, women began entering the workforce at higher rates in the 1960s than in the past. However, the negative correlation between female labor force participation and fertility ‘flipped’ in the late 20th century and is now positive in many advanced industrial and post-industrial democracies (see: “Is Low Fertility a Twenty-First-Century Demographic Crisis?” S. Philip Morgan in Demography, Vol. 40, No. 4). The flattening out of the birth and baptism rates in the 1970s and early 1980s also coincided with some of the worst economic times in memory. Although many might argue that the current recession is more severe, it is the case that the Misery Index (unemployment rate plus inflation rate) reached two severe peaks in the 1970s and 1980s that are significantly higher than current readings. These economic troubles may have affected the pocketbooks and psychology of many Americans who in turn decided to put off having children as they did during World War II and the Great Depression. They may be doing so again now, with the nation at war and slowly recovering from a severe recession. Concurrent to these socio-economic changes were two very important Supreme Court decisions. The first is Griswold v. Connecticut (1965) where the Court’s majority argued for a national right to marital privacy in the use of contraceptives. The second was Roe v. Wade (1973) where the Court’s majority argued for access to legal abortion with limitations on the basis of a women’s right to privacy. The Church opposed both decisions and its teachings regarding these issues were outlined in Humanae Vitae (1968). Below, we measure statistically the impact of these potential factors in a series of regressions. The data are annual and thus any regression model will likely have correlated error terms across observations (the crude baptism rate in year t will be similar to this rate in year t-1). This violates some of the core assumptions of statistical regression modeling. To control for the nature of the time series data we have ‘lagged’ the dependent variable one year as a baseline predictor. To the degree that other variables can account for the remaining variance we can potentially understand changes over time. As the results for Model 1 below indicate, three of these factors have a measurable statistically significant effect on the crude baptism rate in any given year: 1) the crude Catholic marriage rate, 2) the crude U.S. birth rate, and 3) female labor force participation. Ceteris paribus, there are no statistically significant direct effects related to the crude U.S. marriage rate, the Misery Index, or the Griswold or Roe decisions. Historically, in periods where Americans were having more children in general, where Catholics were marrying in greater number in their parishes, and where women were more active in the labor force, more baptisms per 1,000 Catholics were celebrated nationally. Yet, Model 1 includes a number of factors that are not statistically significant, which in turn create collinearity problems with other variables (predictors being correlated with each other). The most statistically efficient model including the fewest collinearity disturbances is shown in the table below. The strongest factor identified is still the overall U.S. crude birth rate. Thus, it is possible that some of the independent variables which have no direct effect on the crude baptism rate may affect this indirectly through their influence on the overall number of births per 1,000 population in the United States. We test for this in Model 3 below. Once again we control for the time series nature of the data by lagging the dependent variable. Only one factor other than this lagged variable emerges as statistically significant: the dummy variable measuring the Griswold v. Connecticut decision. This is negative representing a sustained decline in U.S. fertility overall following this Supreme Court decision. Once again potential collinearity issues indicate the removal of some of the variables may be necessary. The most efficient model is shown below. In 1964, just a year prior to the Griswold decision and four years before Humanae Vitae, a Harris survey asked a national sample of adult Catholics the following question: “Right now, Catholics are forbidden by the Church from using artificial birth control devices. Would you like to see the Catholic Church decide to allow Catholics to use birth control devices (contraceptives) or would you oppose that?” Fifty-two percent of the respondents said the Church should allow use, 13% said the Church should not, and 33% were not sure. Following the Griswold decision, surveys show that the attitudes of Catholics and non-Catholics were generally accepting of contraceptive use. American Catholics Today (D'Antonio, Davidson, Hoge, and Gautier; 2007), shows that there has been little change over time in the percentage of Catholics who believe Church leaders should have the final say about the morality of contraceptive use. Older Catholics are generally more likely than younger Catholics to look to Church leaders on this issue. 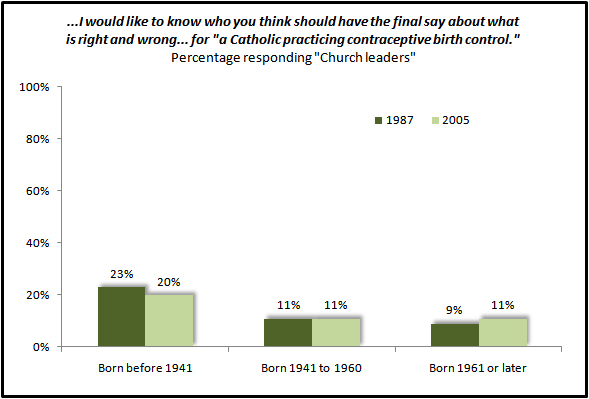 However, even among those born before 1941, only one in five believe Church leaders alone should have the final say on contraceptive use. In the wake of these historical events, Catholics and non-Catholics alike began to redefine their notions of a 'ideal' family size. 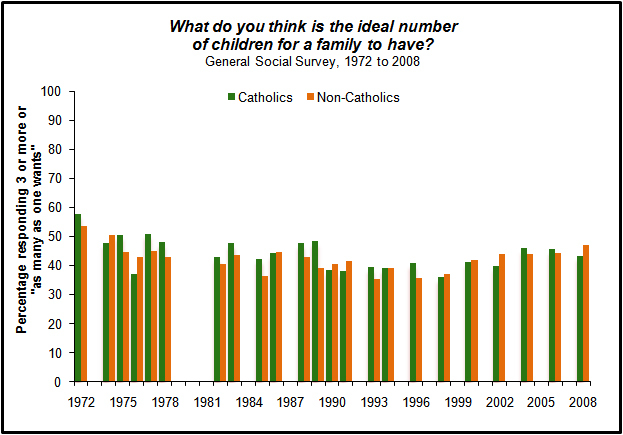 In the 1972 General Social Survey (GSS), 58% of adult Catholics said that they thought the “ideal number of children for a family to have” was three or more (or “as many as one wants”). Response to this question received a GSS series low of 36% in 1998 and has since rebounded to 43% in the most recent GSS of 2008 (In most years the number of non-Catholics responding as such have been very similar). 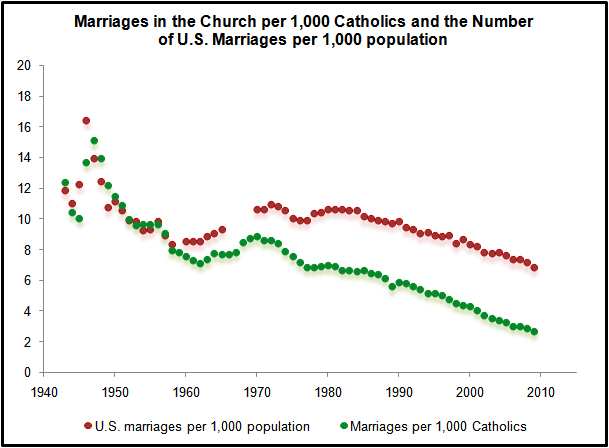 The decline in the Catholic marriage rate is another story altogether. This is a case where there is not as strong a link to the overall crude marriage rate in the United States (R=.816). Although Catholics have been and are just as likely to marry (and divorce) as non-Catholics in the United States (see: “Marriage in the Catholic Church: A Survey of U.S. Catholics”) there has been a declining number of celebrations of the sacrament of marriage in the Church. Many Catholics are still marrying but choosing to do so in greater numbers outside of the Church, in a civil ceremony or in another house of worship (without convalidation). 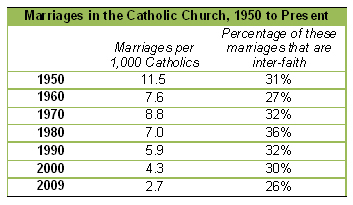 The number of marriages celebrated in the Church per 1,000 Catholics exceeded 10.0 in each year from 1943 to 1952 (the crude marriage rare for the U.S. did the same until 1951). At this point, the post-war Marriage Boom that precedes the Baby Boom began to slow. In 1958, the number of marriages celebrated in the Church per 1,000 Catholics began to consistently fall below the number of marriages overall in the U.S. per 1,000 of the population. As each decade has passed the gap has widened. In 2007, there were 6.8 marriages per 1,000 residents of the United States. By comparison, there were only 2.7 marriages celebrated in the Church per 1,000 Catholics in that same year. The ‘x-factors’ for marriage decline emerged in the late-1950s and have gained strength as years have passed. The data are far more limited to test potential hypotheses. Many may assume it has something to do with rates of inter-faith marriage—Catholics marrying non-Catholics (In these situations a Catholic spouse presumably must negotiate with a non-Catholic spouse for where the marriage ceremony will take place). Yet, there has been no real identifiable increase in inter-faith marriages in recent years. These peaked within the Church between 1975 and 1980 (above 35%). The percentage of marriages celebrated in the Church between a Catholic and non-Catholic spouse has been below 30% since 2002. There is no indication that marriages outside of the Church involving Catholics are becoming more likely to involve a non-Catholic spouse. Data for these are difficult to obtain, as they could be celebrated in a variety of other religious settings or in a secular venue. Surveys regularly ask about the religion of spouses at the time of the poll. However, these cannot tell us what faith they were in at marriage (and these marriages could have been celebrated this year or 40 years ago). According to the General Social Survey an average of 20% of Catholics were married to a non-Catholic spouse in the 1970s. In the 1980s this figure was 21% followed by 24% in the 1990s and 23% in the 2000s. Differences between decades are within survey margins of error for the Catholic sub-group. Thus, there is no significant measurable increase overall in the percentage of U.S. Catholics who say they are married to a non-Catholic. The fact remains there is a very real measurable decline in the percentage of Catholics choosing to marry in the Church, along with fewer baptisms each year. Given past trends and the current state of the economy, 2010 is unlikely to be a year in which the number of celebrations of these sacraments increases. In August 1990, Pope John Paul II published an apostolic constitution on higher education titled Ex Corde Ecclesia. Among other things, the document calls for renewal in Catholic identity at Catholic higher education institutions. In the 20 years since, noticeable changes in Catholic higher education have taken form. 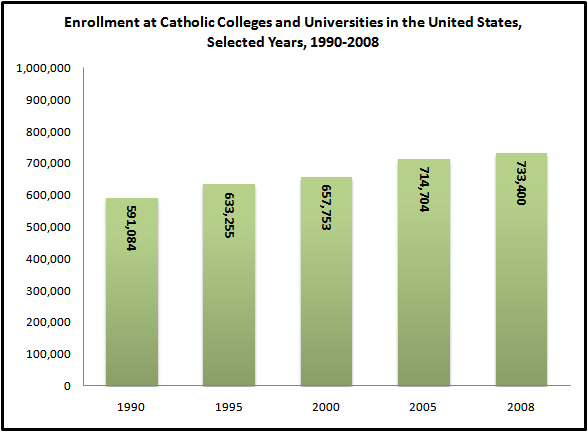 For example, Catholic colleges and universities have seen an increase in student enrollment since 1990 of 24% (Source: U.S. Department of Education Institute of Education Science National Center for Education Statistics, Integrated Postsecondary Data System, IPEDS Data Center). 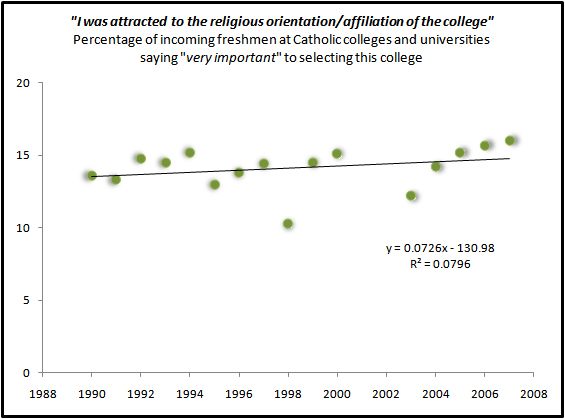 Since the publication of the document, the number of incoming freshman citing the importance of the religious orientation/affiliation of the university at Catholic higher education institutions has risen slightly, from 13% in 1990 to almost 16% in 2009 saying the religious orientation/affiliation is “very important” (Source: Higher Education Research Institute Cooperative Institutional Research Program, The Freshman Survey). 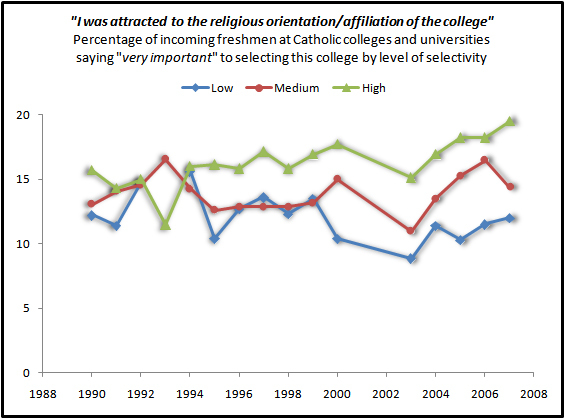 Increases in the attraction to the religious orientation/affiliation of Catholic colleges and universities are higher at those schools where it is more difficult to gain admissions. Incoming freshmen at Catholic colleges and universities with high selectivity were more likely than those attending institutions with lower selectivity to say the religious orientation/affiliation of the Catholic institution was “very important” to them. According to the results of recent CARA Catholic Polls (CCP), generational changes are underway that are transforming the demography of the U.S. Catholic population. Through a combination of immigration and different fertility rates among sub-groups of the population, racial and ethnic identities of the Catholic population now vary significantly by generation. The “Pre-Vatican II Generation,” ages 68 and over in 2010. The Pre-Vatican II Generation was born in 1942 or earlier. Its members came of age before the Second Vatican Council. Members of the Pre-Vatican II Generation currently make up about 12 percent of the Catholic population. The “Vatican II Generation,” ages 50-67 in 2010. These are the “baby boomers” who were born between 1943 and 1960, a time of great demographic and economic growth. They came of age during the time of the Second Vatican Council and their formative years likely spanned that time of profound changes in the Church. Vatican II Generation parishioners currently make up 31 percent of the Catholic population. The “Post-Vatican II Generation,” ages 29-49 in 2010. Born between 1961 and 1981, this generation, sometimes called “Generation X” or “baby busters” by demographers, has no lived experience of the pre-Vatican II Church. Thirty-eight percent of adult Catholics are members of the Post-Vatican II Generation. The “Millennial Generation,” ages 18-28 in 2010. This generation, born in 1982 or later (up to 1992 among adults), have come of age primarily under the papacies of John Paul II and Benedict XVI. Because some still live with their parents, their religious practice is often closely related to that of their families of origin. Nineteen percent of adult Catholics belong to the Millennial Generation. As the figure below shows, differences between these groups are not limited to age. 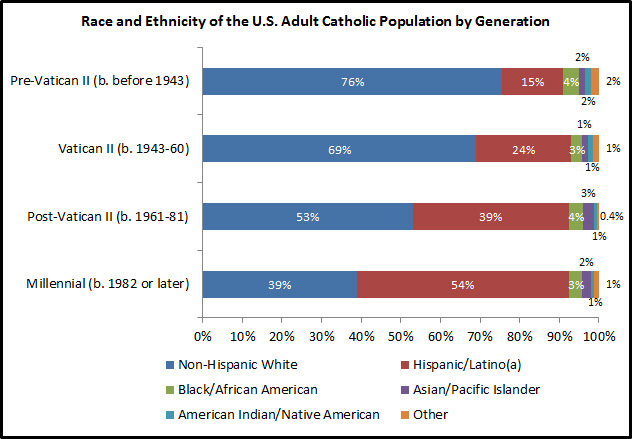 Estimates based on the aggregated results of multiple recent CCPs indicate that three in four of the oldest generation of Catholics self-identifies their race and ethnicity as non-Hispanic White. By comparison, just fewer than four in ten of the youngest generation of adult Catholics identifies as such. Very similar proportions of Catholics self-identify as Black or African American, Asian or Pacific Islander, or Native American across generations. However, the most significant growth occurs among Catholics self-identifying as Hispanic or Latino/a. Just 15 percent of Pre-Vatican II Catholics identified as such, compared to 54 percent of Millennials. There is a fifth generation on the horizon. Although there is no clear rule for dividing generations it is generally accepted that Catholic children born today are not Millennials (that generation began with those born in 1982 and ends approximately with those born in 2002). There is still much research to be done on Millennials. Generally we can only know about those age 18 or older with surveys. Thus, about half of the Millennial Generation (those born 1993 to 2002) are not in “view” yet of polling. There is no indication that this portion of Millennials or the fifth generation that is being created now will alter this trend toward greater racial and ethnic diversity among the Catholic population.